We are experiencing a heatwave here in jolly, old England. It's a glorious 25C and today I'm hoping to get a bit sunburnt. I turned on the oven this morning to roast a sweet potato and quickly realized that that was a BAD idea. Now is not the time for ovens, now is the time for picnics with bug hunks of cheese, thin slices of spicey charcuterie and jars of vinegary, crunchy veggies. This pickles cauliflower turned out quite well. I added chilies and lemon to the brining water, and kept the spice quite simple; green peppercorns and coriander seeds. I par-boiled the cauliflower until it was just barely softened. The result was crunchy, bright pickles with a touch of zing. I have to stress again how simple it is to make refrigerator pickles. If pickles don't have to be shelf-stable, then it's really just making the brine, stuffing the jars and leaving them in the fridge for a few days, nothing simpler. Bring a pot of salted water to a boil. Cut up the cauliflower. Par-boil the cauliflower for 3 minutes, drain and dunk in a bowl of ice-water. Put the vinegar and water in the sauce pan with the spices. Bring to a gentle simmer. Make a layer of cauliflower, put slices of lemon over it and stuff garlic down the sides. 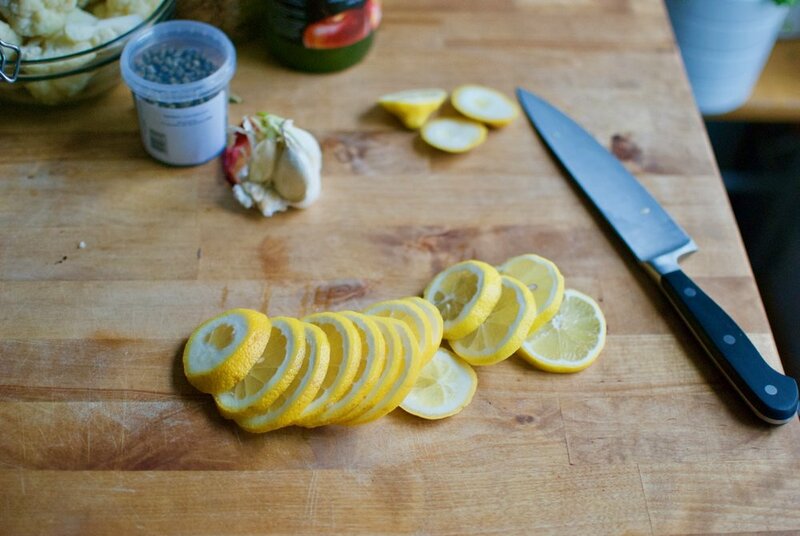 Repeat until the jar is full and the lemons and garlic are evenly distributed throughout. 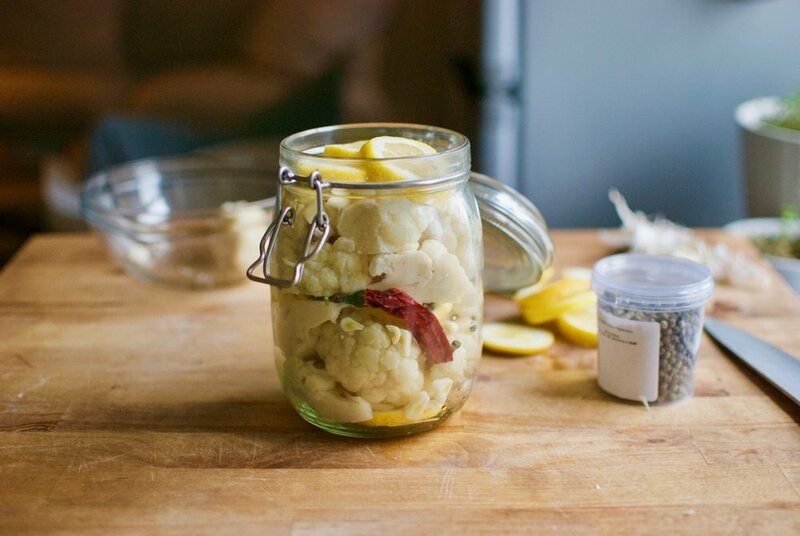 Pour the hot liquid into the jar until the cauliflower is completely covered. Cover with lid and rotate jar to work out air bubbles. Place in fridge for 3-4 days, then enjoy with cheese, crackers, charcuterie and sunshine.